Lost in the Who's It Gonna Be? Yankee managerial hoopla, the A-Rod "Me-stakes" and the Colts-Pats "Game of the Century of the Week" is the fact that two New York sports heroes have passed on. Not "passed on" as in died. "Passed on" as in two sports dreams that started so well and with such promise, ended not the way they were supposed to. 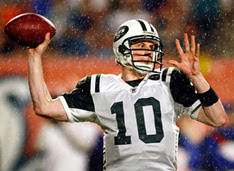 The Jets have announced that starting this Sunday, James Chadwick "Chad" Pennington is no longer the starting quarterback, and that Kellen Clemens is taking over. This was a move a long time coming. Never a power passer, Chad had enough arm to earn a 65.3 career completion percentage, 2nd all-time. That said, anyone who has watched Jets games knows that Chad's arm is done, injuries having turned his shoulder into Play-Doh. And more than fans knowing this, is that opposing defenses know this. If every 5-yard out pass from Chad is a threat to be jumped by a cornerback because the ball sails to the receiver like a half-dead balloon, you know that your QB is done. But even though the Jets needed to bench Chad doesn't mean we have to b e happy about this. Pennington was nothing but a team-first work-a-holic. This is a guy who took the Jets playbook on his honeymoon, and who came back from two shoulder surgeries to win Comeback Player of the Year. A Rhodes Scholar who applies his smarts to endless hours tape dissection, No. 10 did whatever coaches asked, and deflected praise to teammates. In today's self-promotional sports world fill of Chad Johnsons, Deangelo Halls and PacMan Jones, Chad was that rarest of things, a true sportsman. If this talk sounds like Chad is gone, it's not meant to. It's just that, in every Jets fans' gut, the posterboy for the Jets is no more. Chad might start again; more likely, he'd back up Clemens and in true team fashion, tackle that role with class. Essentially, he's quarterback option 1A for the Jets. But he's the Franchise no more. The Injury Gods have taken care of that. It was kryptonite of a different sort that took down another New York sports hero. Don Mattingly, dubbed "Donnie Baseball" by Kirby Puckett, was done in by a bad back that robbed him of his natural graceful swing, and what should have been a Hall Of Fame career. For most of the 80's, Donnie Baseball was everything you wanted in a hero. Drafted unceremoniously in the 19th round of the draft, Mattingly used hard work and baseball smarts to make it to the big club. In 1984, he beat out superstar Dave Winfield on the last day of the year (going 4 for 5) to win the batting title. In 1985 he earned the MVP by hitting 48 doubles and 145 RBIs. In 1987 he tied a record by hitting a homer in 8 straight games. That year, he set the major league record for grand slams in a season with 6. And he was no slouch at 1st base either, with gold gloves from 1985 through 1994. But towards the end of his career, The Injury Gods struck, and in the worst place for a sweet-hitting 1st-baseman, the back. And with the injury, came a tailing off of his numbers. Though never bad, instead of in the mid .300s, his batting average hovered around .290. instead of lacing doubles to the gap, now No. 23 was a second late, and out dribbled a weak grounder. After 1989, Donnie Baseball never touched 20 HRs again. Aside from a balky back, Mattingly also had to endure the turmoil of Chez Steinbrenner—during the height of George's power in the 80s. From 1983 through 89 alone, No. 23 had to endure 8 managerial changes—stability not being Steinbrenner's focus. Along with the managerial changes, Mattingly also had to endure King George's weakness for signing overpriced, over-the-hill players who folded in NYC. Not exactly the 1927 Yankees, Mattingly's early 90s Yankees were, to put it politely, crap. (Danny Tartabull? Andy Hawkins?) Donnie Baseball took this all with his customary class and humility. In an Yankee era filled with egos and indifference, scandal and mediocrity, Mattingly was the sole light. Retiring a year too soon in 1995, Mattingly watched the late 90's Yankees win World Series after World Series. The ring that most likely kept him out of the Hall of Fame so close but so far away. And when he came back in 2003, first as batting coach, and then as bench coach, a generation of Yankee fans had reason to feel that, like Superman, their hero, No. 23 could defeat his back and get that ring, once and for all. Alas, it's not to be. This week, Don Mattingly, No. 23 has been rumored to take a job as bench coach for the Los Angeles Dodgers. The man who once said "The Pinstripes are in my blood," would be wearing Dodger Blue. And even if, God Willing, he gets his ring, it would not be in Pinstipes, with a tickertape trip through the Canyon of Heroes. And while Chad, too, could get his own ring, the smart money says that No. 10 probably lost any realistic chance to hoist the Lombardi trophy in a bath of champagne. Watching Pennington these past few weeks, playing gamely, but just a shadow of his former self, reminded me of watching Mattingly during the last third of his career. Occasionally you'd catch a glimpse of the talent, the brilliance, but mostly it was frustration and sadness. Now, No. 23 will be in a different uniform and No. 10 will be on the bench. You can't help but get the feeling, that this wasn't the way it was supposed to end. But why did Donnie leave? He had to know it was a little too early to take over. Learn from another great coach and be prepared for the next opportunity. For someone who bled pinstriped blood, his leaving is just wrong. Was he mad at the way Torre was handled and left on his behalf? Chad? I am also sad to see benched. I am a Cowboys fan and have no stake in this (ahhh, steaksss), but always liked what I saw from Chad. He seemed like a classy guy (a trait missing in too many athletes). His prime is over, so I am not against his benching. Still, it is sad. Word is Donnie left because he didnt want to be a distraction to Girardi. You know once the Yanks went on a 3-game losing streak the papers would have a pix of Don and Joe and say "Did the Yanks make the wrong choice." So typical classy Don, he quietly chose to tutor under Torre some more and wait for the next chance. I've never liked the Yankees, but I always admired Mattingly. I felt he was always in a bad situation there with the crap around him. As for Pennington, I had always hoped he would be able to come back from his injuries, but apparently a full recovery was not to be. He seemed to be able to handle all of the adversity there very well.